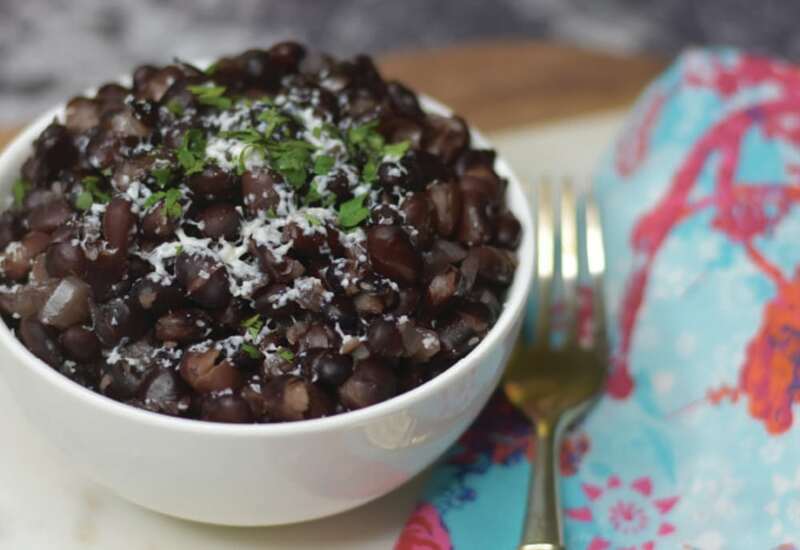 Black beans are fast and easy to make in your pressure cooker. The quick-soak method of pressure-cooking dried beans for 1 minute at high pressure removes the need for an overnight soak. After your initial quick soak you can proceed with the rest of the recipe as if your beans had been soaking all night long. Place beans in inner steel pot of pressure cooker and pour cold water into pot to cover beans by 1 inch. Lock pressure cooker lid in place and turn steam vent handle to Sealing. Select Pressure Cook and cook on High Pressure for 1 minute. When cooking is complete, move steam vent handle to Venting to quick-release pressure. Drain and rinse beans under cold water, discarding cooking liquid. Return beans to inner steel pot of pressure cooker. Stir water and chopped onion into beans. Lock pressure cooker lid in place and turn steam vent handle to Sealing. Select Pressure Cook and cook on High Pressure for 15 minutes. Let pressure release naturally. Drain any excess cooking liquid until desired consistency is reached. Season beans with salt to taste and top with cheese and cilantro (or your favorite toppings) to serve. This basic recipe has plenty of room to add chilies for spice and a variety of toppings for more flavor. Per Serving: 83 calories; 1g fat; 14.3g carbohydrates; 5g protein; 1mg cholesterol; 171mg sodium.